John Garner of the Cape Cod Times accepting award as Employer of the Year. 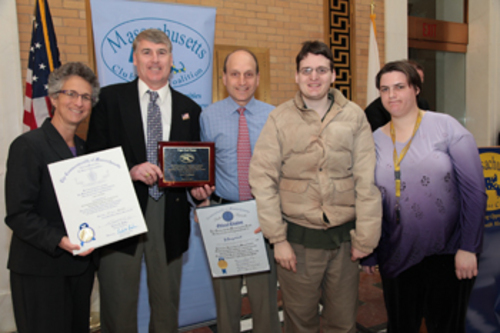 John Garner, single copy/circulation sales district manager of the Cape Cod Times accepting award as Employer of the Year from Cove Clubhouse in Harwich Port at the Massachusetts State House last week from Sen. Dan Wolf and Rep. Sarah Peake and Clubhouse workers Stephen Chase and Sarah Fauteux. It was the second time in three years the Cape Cod Times has been honored for its Hawker Sales Program employing adults with special needs. Several adults also participate from LIFE and the Baybridge Clubhouse in Hyannis, which named the Times newspaper as its Employer of the Year in 2010. The Cape Cod Times, which has a large presence on Main Street, Hyannis, celebrated its 75th anniversary in 2011. John Garner has been the Director of Public Relations and Broadcasting for the Cape Cod Baseball League for 12 years.